North Devon farms will be serving up ‘proper job’ farmhouse breakfasts to celebrate Farmhouse Breakfast Week. Farmhouses up and down North Devon will be serving freshly laid eggs from free range, ‘happy’ chickens, thick slices of bacon, apple juice often pressed from the orchards on the farm which often forms part of the farmers’ wildlife management. Lets not forget crusty bread that has just been taken from the farmhouse oven, homemade jams and honeys and creamy dairy butter from the cows just outside the farmhouse window. This celebration, of all that summarises the Farmhouse breakfast, is in its 10th year. If you feel stressed, overworked, overcrowded and in need of some tender loving care, a change of scenery, wide open spaces with good food and drink and would like to meet new friends then you’ll have much in common and sympathy with battery hens. At Hollacombe Farm, Celia and Martin support the British Hen Welfare Trust, a small National Charity that re-homes commercial laying hens. At Hollacombe Farm they believe these hens deserve a second chance of life and the freedom they deserve. After a life of being housed in confined quarters the hens love the free range accommodation and quickly adapt, showing instinctive behaviours by dust bathing and scratching in the soil, pecking at grass and sunbathing in the warm summer sun they were deprived of until now. Celia and Martin can give you a similar experience – well you don’t have to join in the dust bathing – but take in the Exmoor views and stretch your legs but no feather pecking see http://www.hollacombefarm.co.uk. Mention ‘Devon’ to Londoners and they get a warm ‘fuzzy’ feeling of green pastures which are managed by caring farmers who produce wholesome food while respectful of the needs of wildlife. In the words of Prince Charles ‘small family farms are the only hope to protect our rural landscape’. The living, breathing countryside is as precious as any ancient Cathedral’. This also reflects the ‘Government Foresight’ report: ‘Land Use Futures’ which recognises and rewards the multiple roles of agriculture not only as a producer of food but also protecting wider ecosystems such as flood risk management, protection of biodiversity and applying low carbon systems. At this year’s North Devon Farm holiday’s AGM it was revealed that over 50% of the accommodation providers had taken up some form of environmentally friendly energy system such as PV panels, small unobtrusive wind turbines for home use, heat source pumps and one organic farm offering free charging for electric cars. Just a few of those farms working to protect the coast and countryside are:- in the Holsworthy region Thorne Park www.thornepark-devon.co.uk Langaton Farm www.langaton-farm-holidays.co.uk West Lake Farm www.west-lake.co.uk and up on the north Devon coast in Ilfracombe Lower Campsott Farm www.lowercampscott.co.uk and Yetland Farm cottages in Coombe Martin www.yetlandfarmcottages.co.uk . Also thanks to Libbaton Golf Club for the use of their clubhouse for our AGM and for providing some of that wonderful food grown in north Devon. Great news as the wool cheque arrives! It is great news on the wool front this year and how lovely to have a really good news story. Last Year’s wool cheque at Little Comfort http://www.littlecomfortfarm.co.uk/ was £52 for our 50 Sheep (approx, as the flock size goes up and down). The cost of shearing was £1.00 a sheep to the shearer and Roger worked with him all day and then had to drive the wool to South Molton which takes time and fuel. So not a very profitable part of our business!! This year the wool cheque has arrived and it is £162!! Three times the value for a very similar amount of wool. This is good news for us as it means that we probably broke even this year on the shearing, but for big sheep farmers this will represent a real gain in their income. It is also a good news story as it means that this wonderful natural product, which can make super, warm clothing, very effective insulation material, furniture etc etc, is now being valued again. Many products that traditionally used to be made with wool have been made using oil recently; maybe the rising cost of oil has meant that wool is once again being valued as it deserves to be. 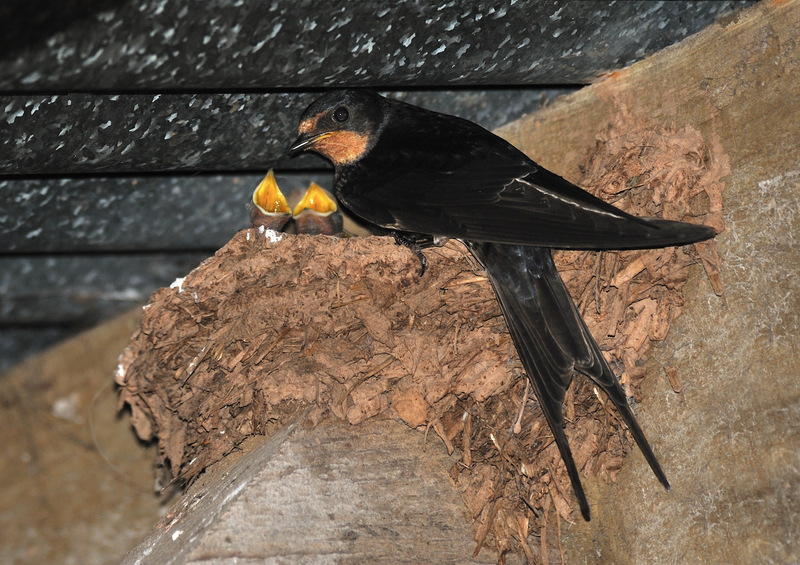 Swallows, House Martins and Swifts enjoy the skies above North Devon and Nesting in our Farm Buildings. This time of year we are often treated to the sight of Swallows , House Martins and Swifts flying over the farms and country side of North Devon, all collecting insects to feed to their young. It can be a great discussion point on who can tell the difference between the three birds. Val Woods guests at www.fordafarm.com are enjoying watching them feed their young in the barn while they have their breakfasts in the house! 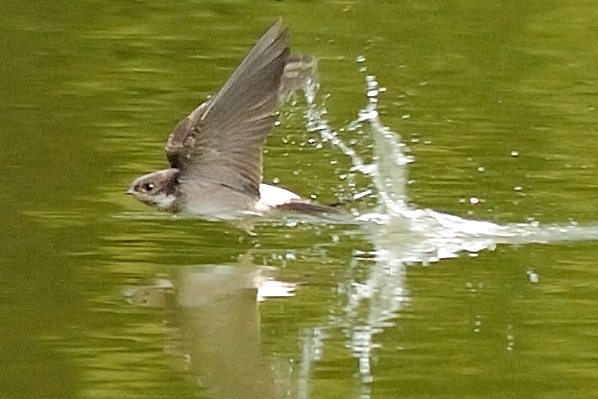 At Little Comfort Farm this summer www.littlecomfortfarm.co.uk we have had great flocks of Martins all feeding on the insects around the lake and drinking from the lake. It is an acrobatic bit of flying to scoop up water on the wing as this lovely picture taken by Ann and Malcolm Hopkins shows. The swallows in the picture are hiding in the barn at Forda Farm. It won’t be long now before they start the long journey back to Africa for a winter in the sunshine. This is our first blog! This is our first blog – lots more to come!